Choosing Joy: How I save--Giveaway! In honor of the holiday and because I am in a great mood, I am doing a giveaway edition of How I Save- Monday. In order to coupon you have to have a great system. I use a big binder but usually once I have my trip planned I leave my binder in the car and take in my compact organizer. So I am doing a fabulous giveaway from now until next Sunday, July 10. I will be drawing a winner on Monday morning. 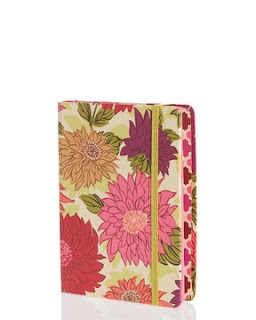 A fabulous petite portfolio from Vera Bradley. I use these for couponing and making lists for my shopping trips. It is small, compact and easy to throw into your purse. It has a file folder on one side and a note pad on the other. My old one (a different brand) just gave out and I found these fabulous deals at Rue La La and I had to have one. I also purchased an extra to giveaway to one of my readers! For those of you who don't know about Rue La La, it is a members only boutique with incredible deals and steals on great items from clothes or bedding to trips. If you click the link above it will give you an invitation from me to join, this is another incredible site with incredible savings that you will definitely want to check out. The deals change every two days so it is always new and exciting! 1. Follow my blog and leave a comment saying you follow. 2. Follow me (jmkbuett) on twitter and retweet this giveaway with "Jenna's having a great giveaway and I want to win! http://thebuettemeyers.blogspot.com/2011/07/how-i-save-giveaway.html" make sure and include me in the tweet so I can make sure it is valid and leave a comment on this post that your tweeted. 3. If a friend becomes a follower and mentions that they found the giveaway from you, you get another entry. I will use random number generator to pick a winner next Monday, July 11. This giveaway is only open to the continental U.S. unless you want to pay shipping. I follow your blog already and would love the orgranizer! Hi, stopping by from Jenna's. I love the picture in your heading. You have a beautiful family! I'm a new follower - found you through Jenna's Journey! I'm a new follower over from Jenna's! I'm a new follower. I found you through Jenna's Journey. I'm a fellow couponer as well and this would be a lot cuter to carry around than my plain old envelopes! I follow and would love an organizer to do better with couponing!